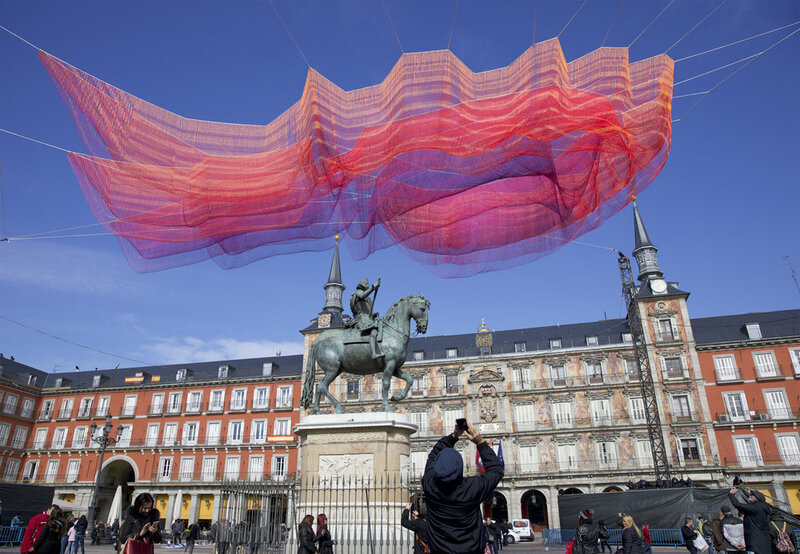 The City of Madrid celebrated the 400th anniversary of the Plaza Mayor with an original sculpture installation by American artist Janet Echelman in February 2018. 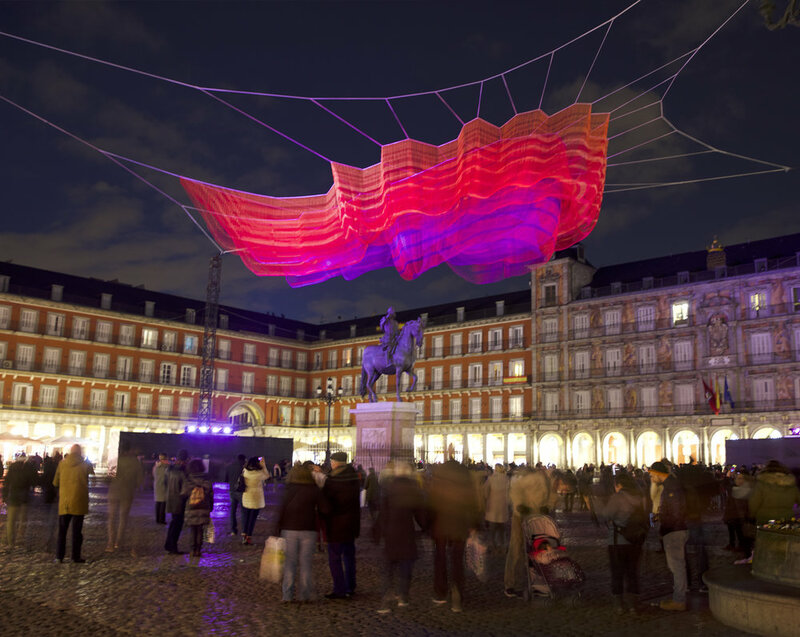 Madrid premiered Echelman’s 1.78 Madrid, a new sculpture that explores the cycles of time. It is the newest addition to Echelman’s Earth Time Series begun in 2010 which has been a focal point in cities in Europe, Asia, Australia, and South and North America. The number “1.78” within the title refers to the number of microseconds that the day was shortened when a single physical event shifted the earth’s mass, thus speeding up the planet’s rotation of one day. This work examines the complex interaction of the many systems of our physical world with one another. The artwork reminds us of our complex interconnectedness with larger cycles of time and the systems of our physical world. The sculpture’s materials embody this. When any one element in the sculpture’s network moves, every other element is affected. Our surroundings affect how we feel and how we experience our lives - we are responsible for the way our cities look and function. These netted works bring softness to the scale of the city. 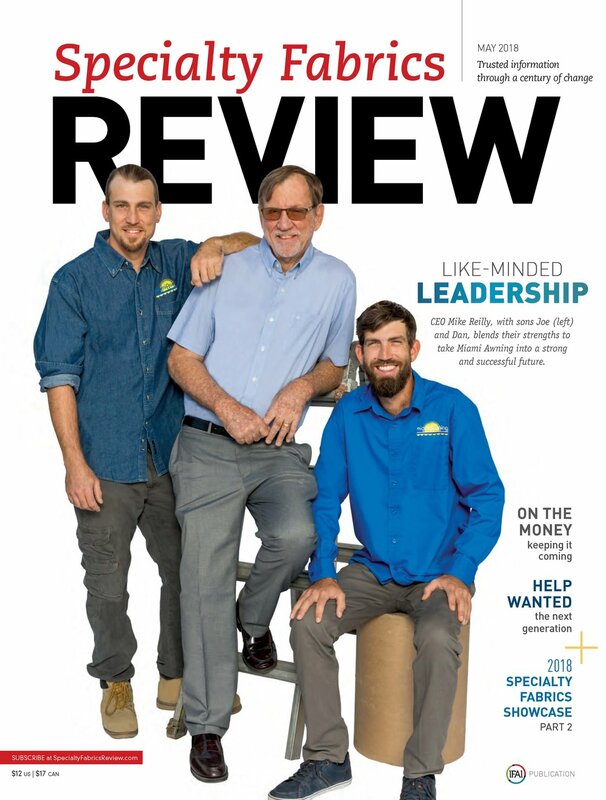 They are soft counterpoints to the hard edges of buildings, offering proof that we can interrogate the status quo - that the assumption that cities must be formed from hard materials and straight edges can be changed. 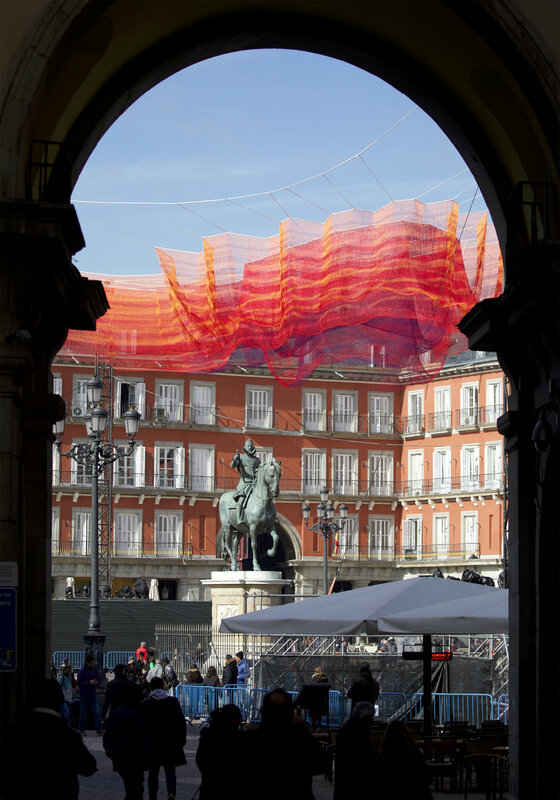 “I feel a need to find moments of contemplation in the midst of daily city life,” Echelman said. “If my art can create an opportunity to contemplate the larger cycles of time and remind us to listen to our inner selves, I believe this can be the start of transformation.” The monumental floating form of 1.78 is composed of layers of highly engineered fiber that is 15 times stronger than steel by weight. The fiber is extruded in vibrant hues, then braided, knotted, and spliced together to create a volumetric form that is choreographed by changing wind and weather. 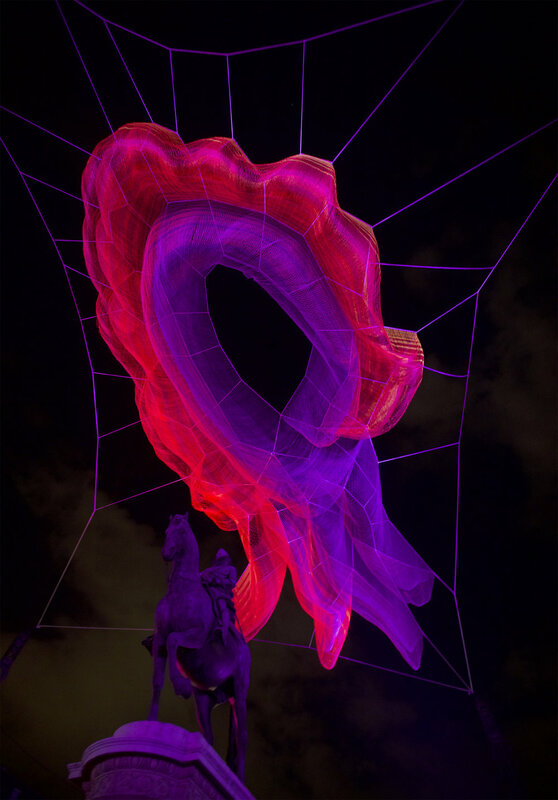 At night, the sculpture comes to life with projected colored light. Lightweight and flexible, the sculpture is designed to travel to cities around the world as a physical manifestation of interconnectedness. 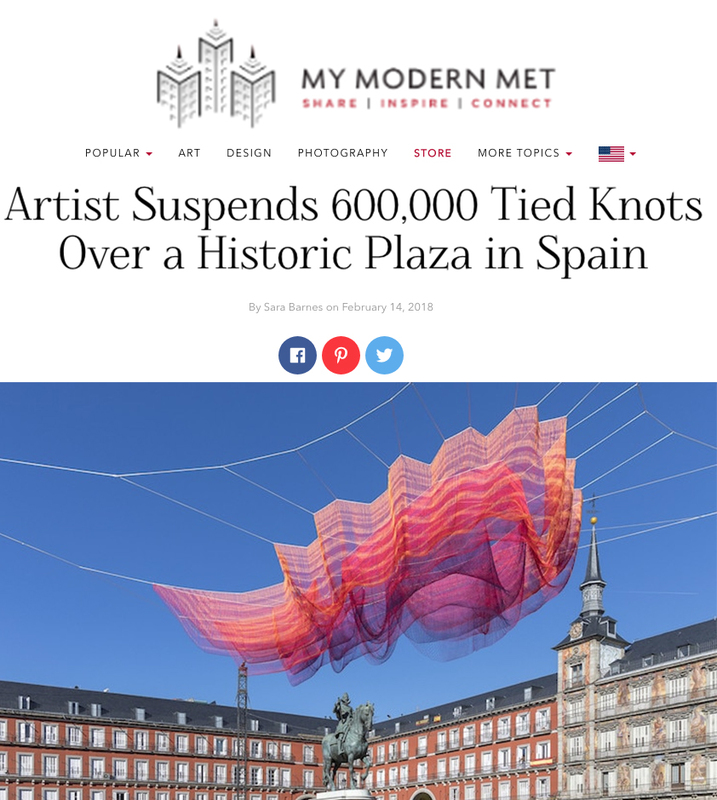 The Madrid site is uniquely special for Echelman. It is the city where she created her very first sculpture integrated with architecture. 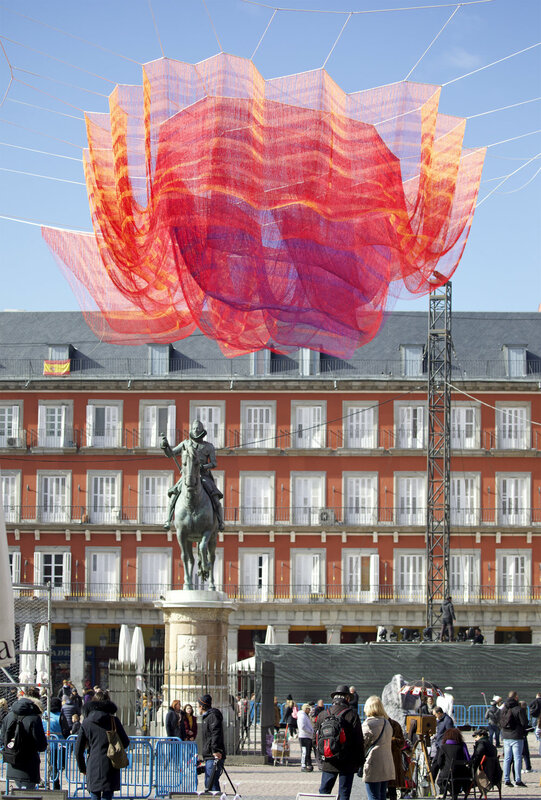 Installed in 2001 in the courtyard of IFEMA for the art fair ARCO, Echelman’s original site-based sculpture Target Swooping Down… Bullseye! laced into the building’s roofdeck railing. The work was created by hand-tying 1.6 million knots to precisely fit the architectural space and its design. Echelman chose to make an artistic dialogue between Jasper Johns’ Target paintings and the round courtyard evocative of bull-fighting rings, referencing the fact that the red center of a target is referred to in English as the “bull’s eye.” In this context, the return of Echelman’s artwork to Madrid now to celebrate the Plaza Mayor takes on special significance for the artist as well as for the city. 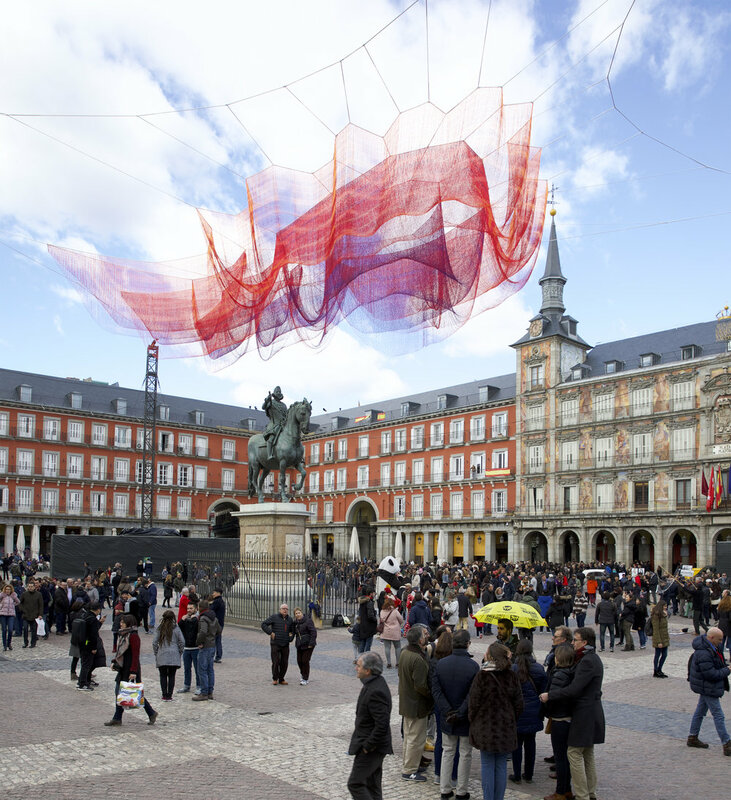 To date, the 1.78 sculpture has been installed in Madrid, Spain (2018), Dubai, UAE (2018).